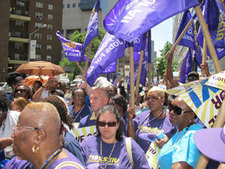 It was a hot day in late spring, but health care workers were turning up the heat on their bosses last Wednesday. Standing on what they called “informational picket lines,” nurses and caregivers held a citywide protest for quality care and better jobs at 100 facilities throughout the five boroughs. The rallies marked the beginning stages of an effort to educate patients and the public about health care CEOs who workers feel are threatening the quality of health care services and jobs in New York City. 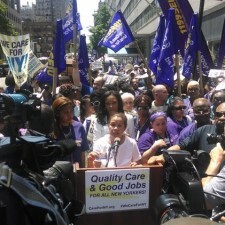 More than 1,000 Local 1199 SEIU members picketed outside Mount Sinai Hospital on the Upper East Side June 18, protesting a contract-talks proposal by the city’s nonprofit hospitals and nursing homes to make “radical changes” in workers’ health benefits. Human rights group Amnesty International is wading into the a massive hospital-worker union’s fight to maintain their own free health coverage. 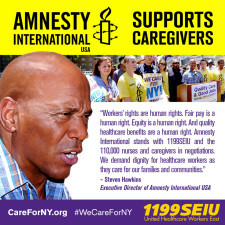 As 1199SEIU on Thursday returned to contract talks with the League of Voluntary Hospitals and Homes of New York employer group, Amnesty Executive Director Steven Hawkins on Thursday vowed to mobilize his 3 million members to back the workers. 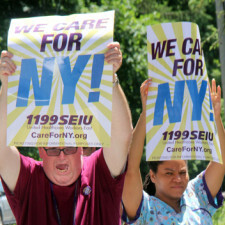 RHINEBECK – Nurses and healthcare workers of 1199SEIU United Healthcare Workers East Wednesday conducted informational pickets at five Westchester County facility locations and one in Dutchess County. The employees, represented by the union, have been in master contract negotiations with the League of Voluntary Hospitals and Homes, the employer group representing most private hospitals, nursing homes and clinics in the area.